Missed Part I of my dread falls tutorial? Find it here! 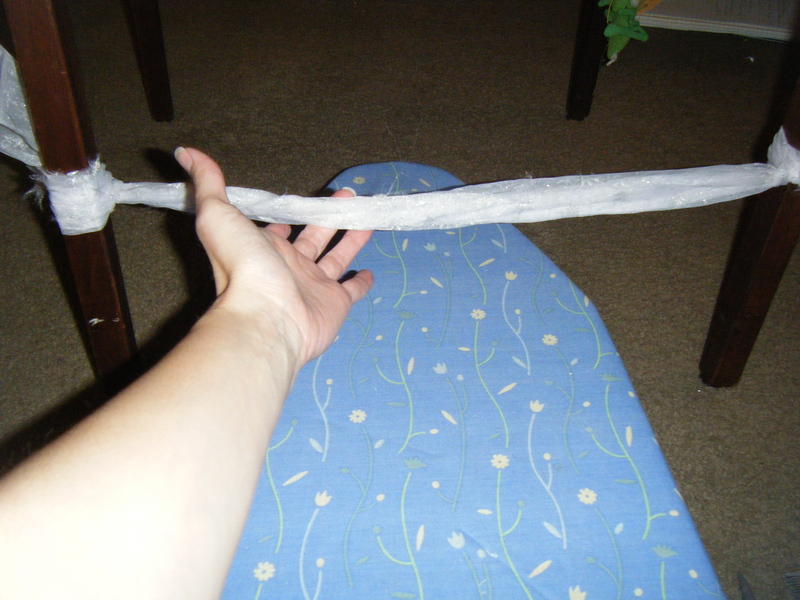 First, you will need to cut some of the elastic. 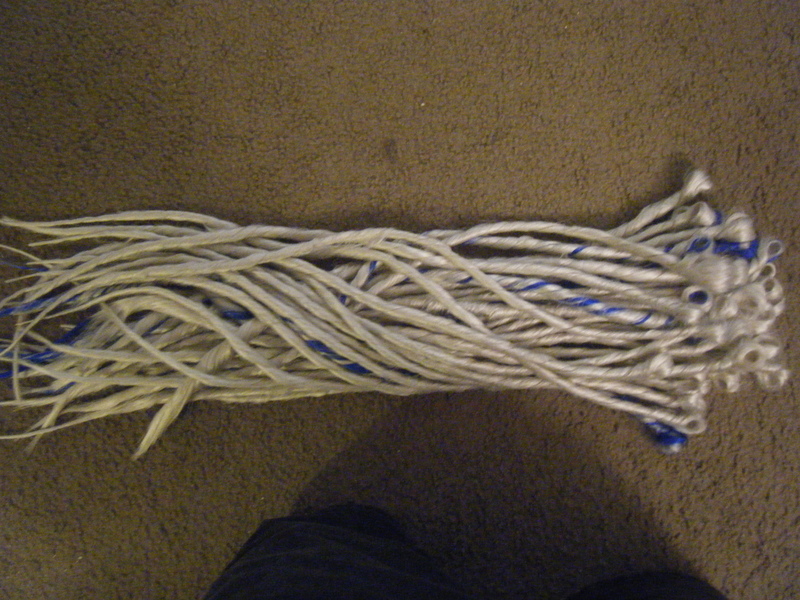 This is what will hold the dreads and allow you to tie them into your hair. Cut two pieces of approximately 12 inches or so (longer if you have a large bun, i.e. a lot of hair) of 1/2″ elastic. 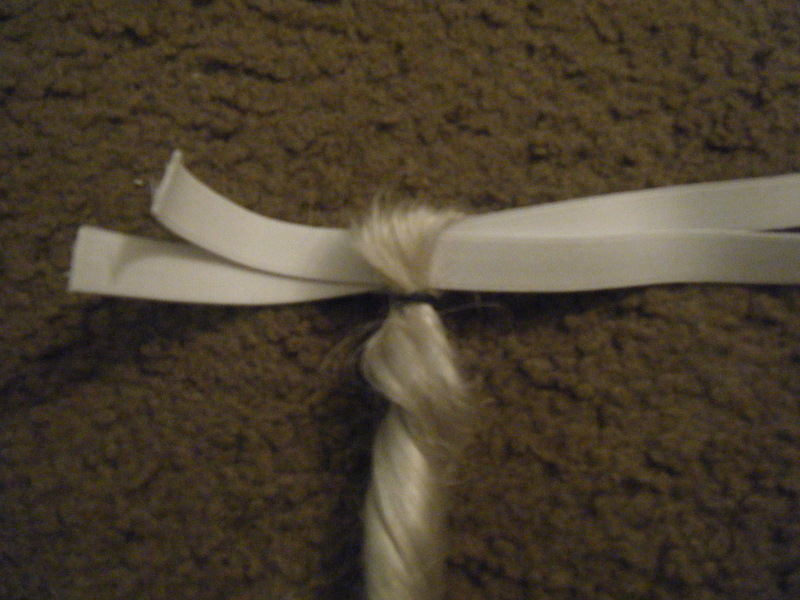 Hold the two pieces of elastic together and slide an “anchor” dread onto BOTH pieces of elastic. Use one of the small rubber bands to anchor the dread at the loop to the elastics. The rubber band needs to be tight, because this dread will keep all the others from falling off! 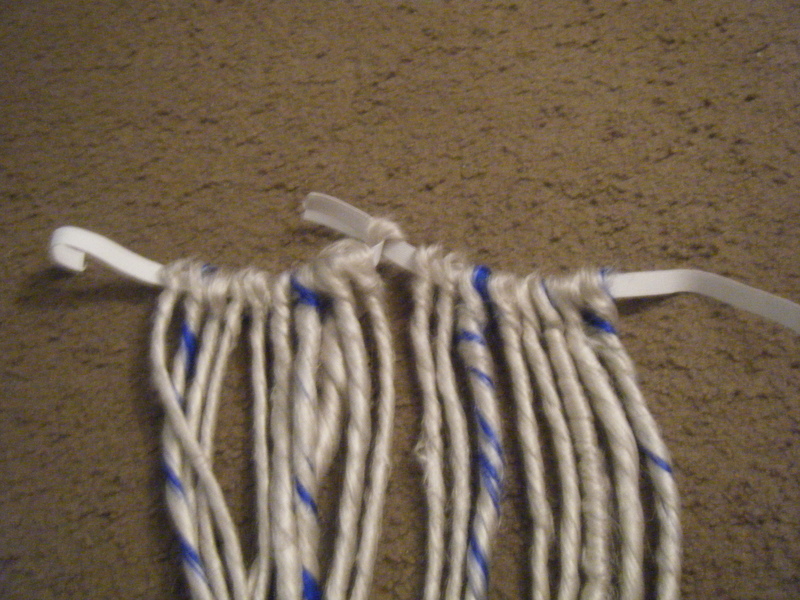 Next, separate the two pieces of elastic and start slipping dreads onto each SINGLE piece of elastic. Add them equally to both pieces of elastic, and, if you have multiple colors, randomly space those out. 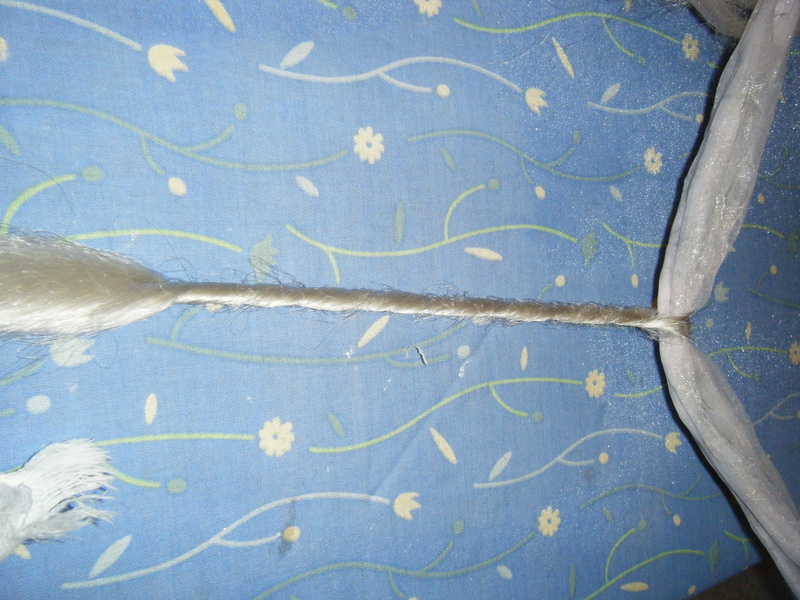 Make it too ordered, and it might look weird and unnatural (yeah, because white and blue are natural…). Leave one last dread out as your second anchor. 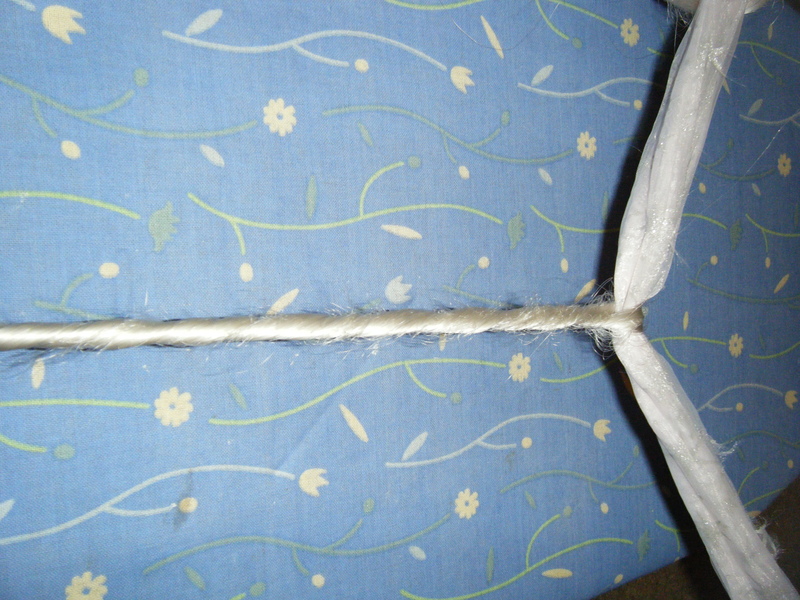 Add your second anchor dread by slipping the dread over BOTH pieces of elastic, just as you did in Step 2. Push all the dreads together, giving you a big “O” of dreads. And…repeat! You need two sets of dreads for installation, or even more. When I wear my full set, I actually have 4 dread falls on my head! The next post will be all about how to install them! Keep an eye out for it! Ya know, this post (and the previous one) has taken a lot of work, so, if you enjoyed this post, please consider DONATING. I’d be forever grateful if you donated a little bit of money to cover the large amount of time I used to bring you this post, and others. Support your community! Just click the DONATE button on the right side, and thanks so much! I’ve been asked about my dread falls (side note: dreadlocks are the ones that stay in your hair permanently, and are usually made from your own hair, but can be also made with fake hair. Dread falls are fake hair that you can take out) a lot…are they my real hair? Where did I get them? How did I make them? I’ve both bought and made my own dread falls. I prefer to buy them, but sometimes you just can’t find what you want. Why do I prefer to buy them? My time is valuable, and dread falls take an awful lot of time to make. It’s easier (though not cheaper) to just buy them. The time it takes to make them is why they usually cost so much when you buy them, but I personally think it’s a pretty good deal. But…making them is easy. So, if you have a spare 8 hours or so, go ahead and make them. Yep, it will take about 6-8 hours to make a full set of dread falls. And it will take longer for your first set, trust me. First, tie whatever it is you are using to hold the hair to your chair. 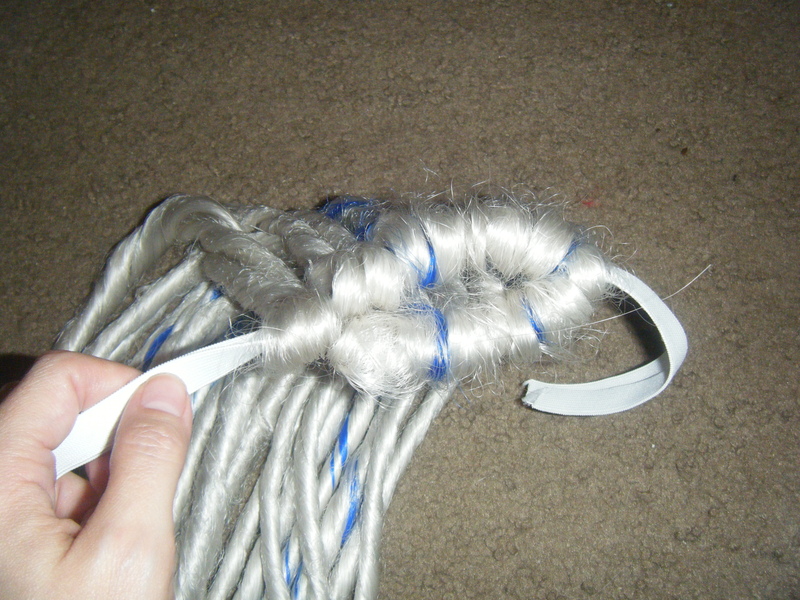 I use this method because it makes a loop at one end of the dread, thus giving you a way to anchor the dread either directly to your head (you braid them in) or to a piece of elastic to make falls. Take a look at the picture, it’s easier 🙂 You need to be able to remove the dread from it at the end! Open up the package of hair. Kanekalon gets EVERYWHERE, so make sure you ALWAYS know where the middle is, and keep it bunched up together or you will have a mess on your hands. Remove the little rubber bands and anything else that holds the hair together. Loop the hair over your holder and let it spread out a bit. 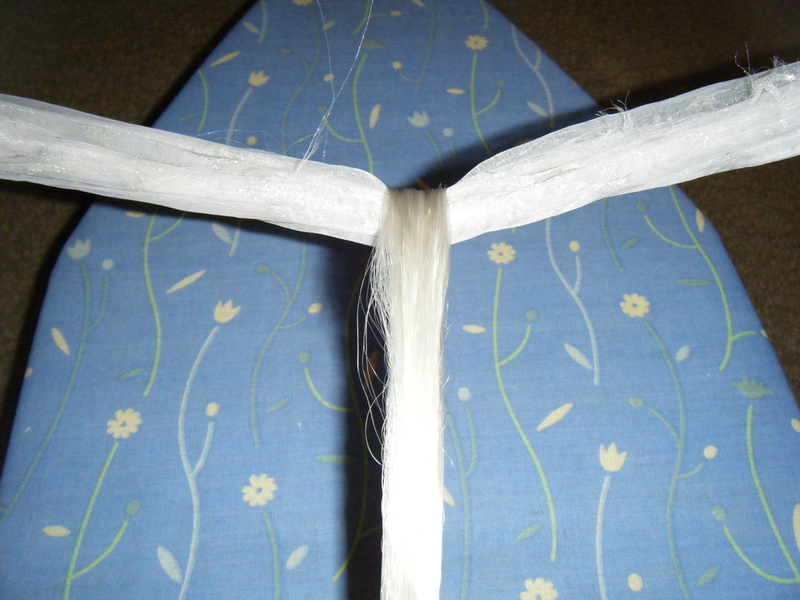 If you are making shorter dreads, cut the hair in half and then loop it over your holder. Take a chunk of hair and separate it out from the rest. Typically, I am able to get 5 to 6 dreads per package of hair, but the thickness will be up to you. Thinner dreads mean you will be making a lot more of them (takes more time) but thicker dreads are harder to steam. Mine are usually about the width of my pointer finger (and I have skinny fingers) or a little thinner. This will now be the “lock” of hair you will be working with. Braid a small section of the lock of hair, only one or two cross-overs. This will help hold the loop and keep the dread together. You don’t need to braid much of it, just enough to keep the loop. Start back-combing using the teasing comb, including the short braid. You will be doing this for good, long while. Make sure to get all sides of the hair, and all the way down to the tips. The hair will start to get fluffy and the braid will make a sort of tangle. Back-comb some more. You will get really tired of it. Once the lock is really fluffy, shove it over to the side. I typically will back-comb an entire package, then steam it, but you are welcome to steam each dread as you finish them. Whatever works for you. 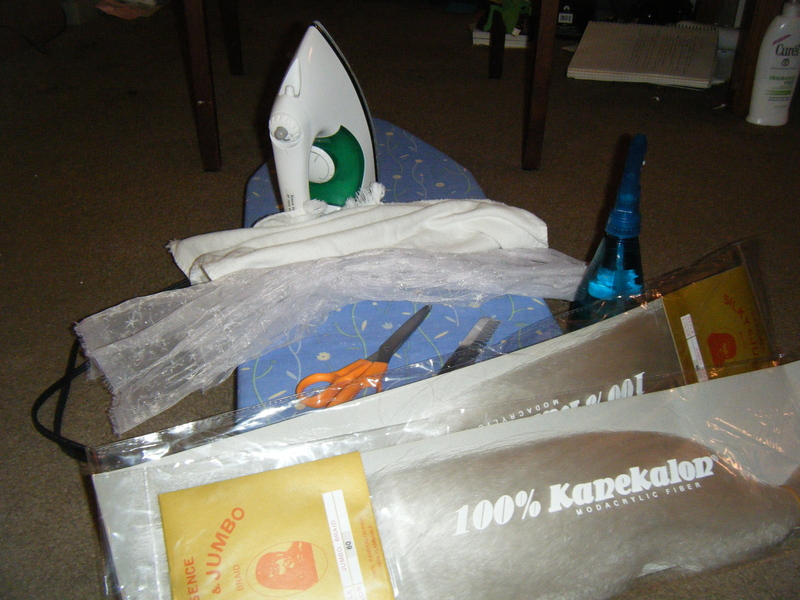 Once you are ready to steam, plug in your iron or straightener. 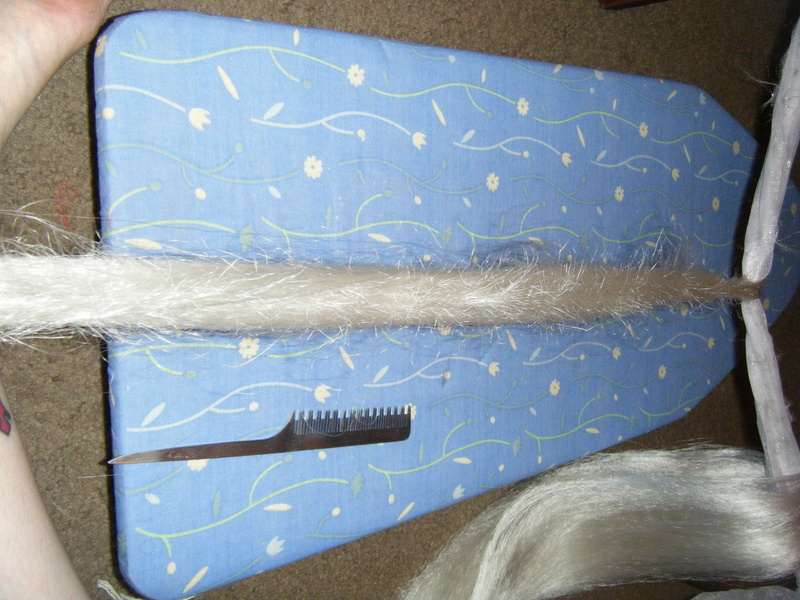 My iron is typically set to a medium-high setting, or the “silk” setting. Kanekalon will melt, so you can’t go too high, but if it isn’t hot enough, the dread won’t stay twisted. You may have to experiment. 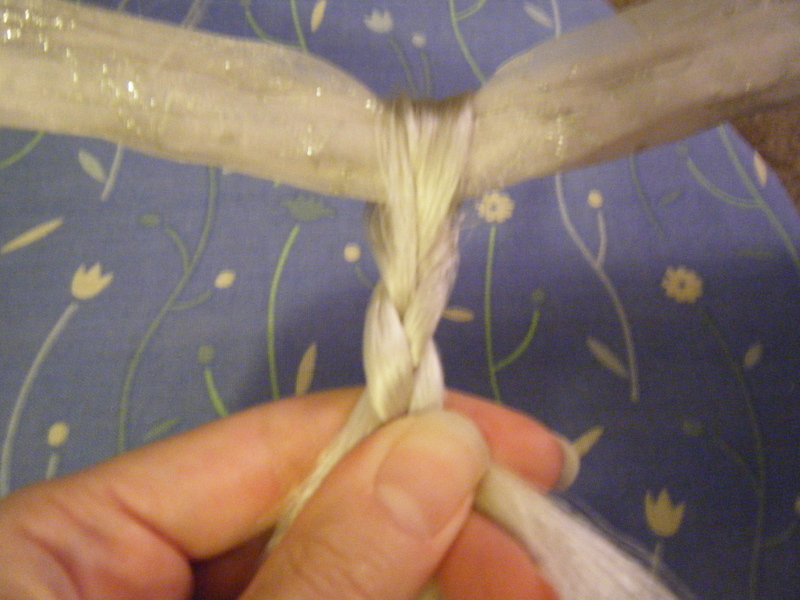 Starting at the loop/braid, start really tightly twisting the dread. It needs to be tight. I don’t twist the whole thing yet; I go in sections, it’s easier to keep hold of and you get less “escapage” from the dread. 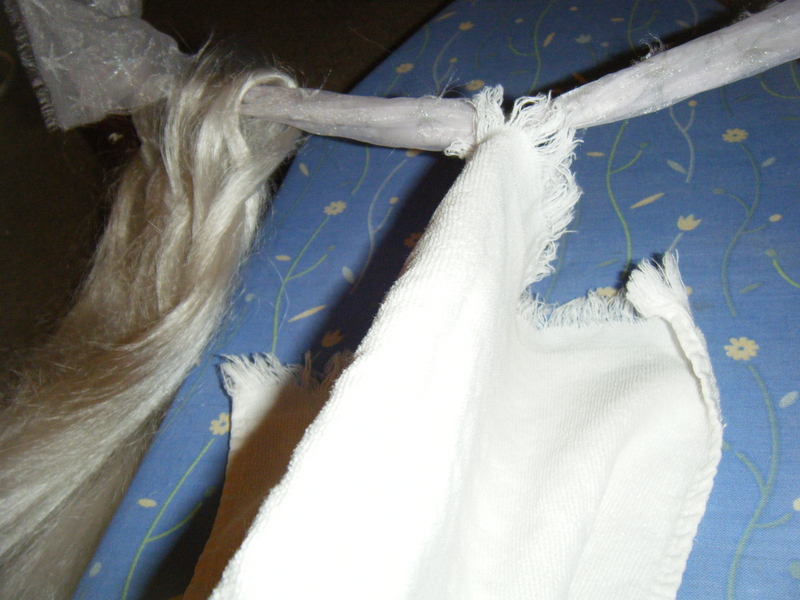 Drape your towel over the dread, making sure it goes all the way up to the loop. Spray down the towel. If this is your first dread, you really do need to soak the towel reasonably well. It doesn’t need to drip, but it does need to be fairly wet. Otherwise it will not create enough steam to hold the dread. This isn’t a problem once the towel is damp after a few dreads, but usually my first dread needs to be resteamed. Place the iron on the top of the dread and hold for 8-10 seconds (it should hiss; if it doesn’t, the towel isn’t wet enough). 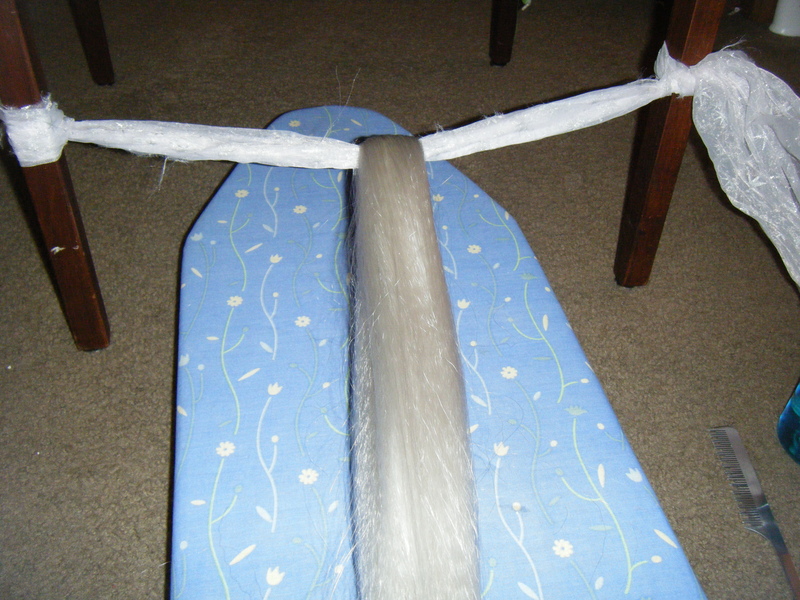 If you are using a straightener, you have an advantage, because you can do two sides at once. With the iron, I then steam each side and the bottom of the dread, making sure the towel covers the dread the whole time. Don’t let the bare iron touch the dread for very long. If using an iron, be prepared to burn your fingers a little with the steam generated. Take precautions. Take the towel off and check the twist. If it stays, repeat steps 10-13 down to the ends of the dread. If it doesn’t, re-wet the towel and re-steam the dread. The end of the dread is tricky. I usually set it on the ironing board, soak it down really well with water, twist it, and then roll the iron back and forth across it. It needs to be really wet and really fast, otherwise the hair will melt to your iron. Messy! Clip any straggly ends off with the scissors and push that dread to the side. Repeat and repeat and repeat! It usually takes me about 45 minutes to do 1 package of hair, but it depends on what I’m doing with the dreads. Fancy effects like two-tones and spiraled dreads take longer. This next step is optional. I like my dreads really tight, and sometimes the iron just doesn’t do the job. I’ll then boil a big pot of water and quickly dip the dread in the water to re-set them. This works especially well to tighten up the loop (stick a wooden spoon handle through the loop before dipping it into the water). It’s also a faster way to re-set all your dreads after a few times of wearing them (they will start to get a little loose). Next time, I’ll show you how to put the dreads on elastic so that you can actually wear them. However, you can also braid these dreads into your hair for a semi-permanent option. Ya know, this post has taken a lot of work, so, if you enjoyed this post, please consider DONATING. I’d be forever grateful if you donated a little bit of money to cover the large amount of time I used to bring you this post, and others. Support your community! Just click the DONATE button on the right side, and thanks so much!